This is where data is helpful for adhering to reality. 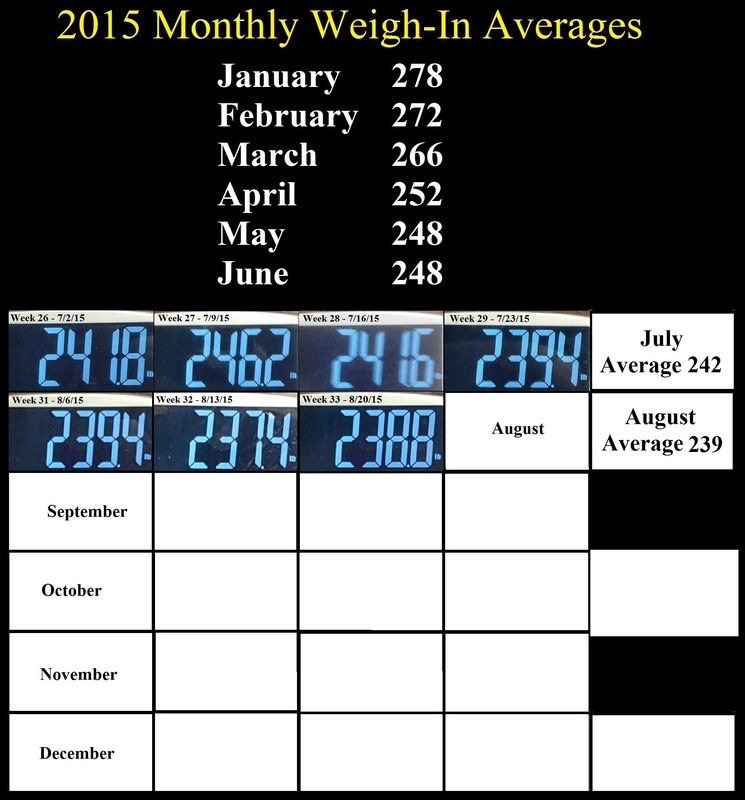 A 238 average isn’t just a new low or only 4 lbs down from the month before but it is also a 10 lb reduction from the months of May & June and that’s good, solid progress. I’ve signed up for 5 more DietBets on DietBet.com. Two of which will take me through February of next year with a goal weight of 222 lbs. That weight will match my bench press competition weight from around 2001, so that will be turning the clocks back about 15 years. 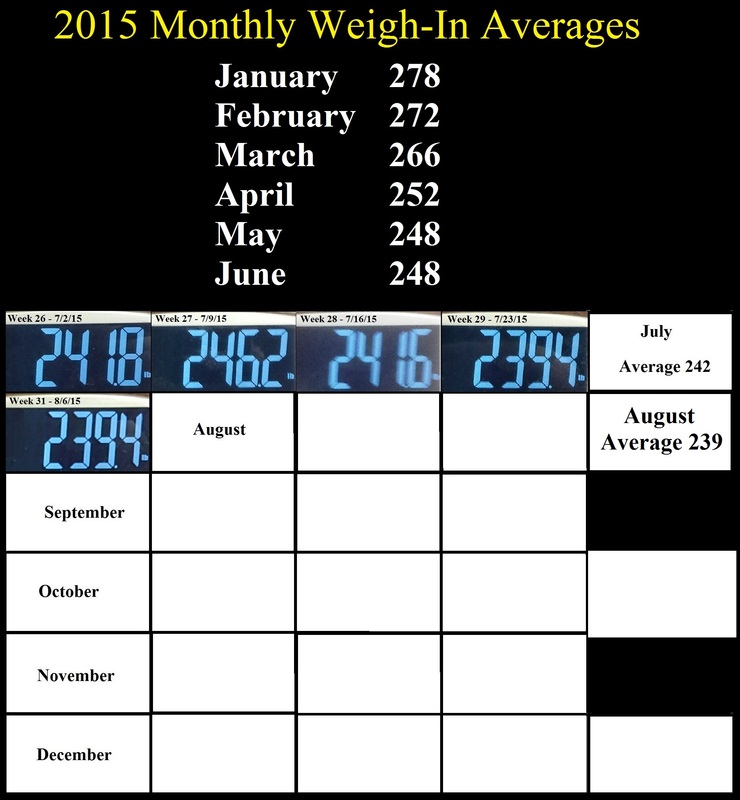 A longer term HealthyWage.com bet is slated to end on July 5th of 2016 with a goal weight of 212 lbs. I’m not sure how far back that rolls the clock but I know my high school or teenage years weight was around 195 to 205 so, 212 lbs pushes the clock back pretty far. Most immediately, I leave for Iowa Falls, Iowa today and will run a half marathon in Iowa tomorrow, meet with family in St Cloud, Minnesota after that run then complete a 2nd half marathon on Sunday in Woodbury, Minnesota which will knock off two more states. I want to “level up” with a group called the Half Fanatics and the easiest way I can do that is by completing as many half marathons in as many different states in a trailing 365 day time period. I’ve learned the full marathons I’ve completed earlier this year in West Virginia and Tennessee don’t count for the Half Fanatics so I’ll have to redo my map a little bit. I’m thinking of keeping that map in an album on Facebook where I can update with additional maps as I complete each new state. I know 30 states is needed to reach the highest level in the Half Fanatics. I have learned that DC counts as a state for leveling up and, offhand, I know I’ll have Illinois, Missouri, Iowa, Minnesota, Washington DC, New York, New Jersey, Indiana and Tennessee …that puts me at 9 states. There is a small amount of jostling still needed to pull off those 9 states but I’m already registered for runs in all those states except New Jersey. I’ll be updating Missouri and Illinois with new upcoming runs that I’m already registered for. Mississippi, Arkansas and Louisiana are do-able in April of 2016 as a three day series – 3 halfs in 3 days in 3 states which would bring me up to 12 states. The biggie is still the New England series which is in May of 2016 which would knock out 7 states in 7 days. Indiana would be the 7th state and is already counted but I would also be able to knock out 6 new states – namely Maine, New Hampshire, Vermont, Massachusetts, Connecticut and Rhode Island thus bringing my total up to 18 states. I have no idea how to pull that all off. no idea. But, that’s part of the appeal. Something new. Something challenging and I’m sure I’ll come up with answers and solutions as time goes by. For now, I have a bit of direction. Maybe I’ll keep a current map in my Running Log tab and ongoing maps in a Facebook album. Mileage goals are still 117 for this month of August with 10 mile increases in my monthly mileage goal for ever month through the rest of this year. Again, I really have no idea exactly how to do all that and it’s more than just a little bit intimidating to me. I am working with a running coach from California so maybe together we can figure something out. After some seemingly stagnant consolidation months in May and June, we’re seeing another downward trend with some new low weigh-ins over these past two months. In May & June my running mileage was at 76 and 72 miles respectively. The changes I’ve made for July and August are twofold. For one thing I bumped my mileage up over 100 in July and am shooting for 10 miles more in August than I had in July (117 vs 107). Also, on July 1st, I started a Running Streak and have maintained running at least 1 mile per day (or more) every day. I’m currently on Run Streak Day (RSD) #44. 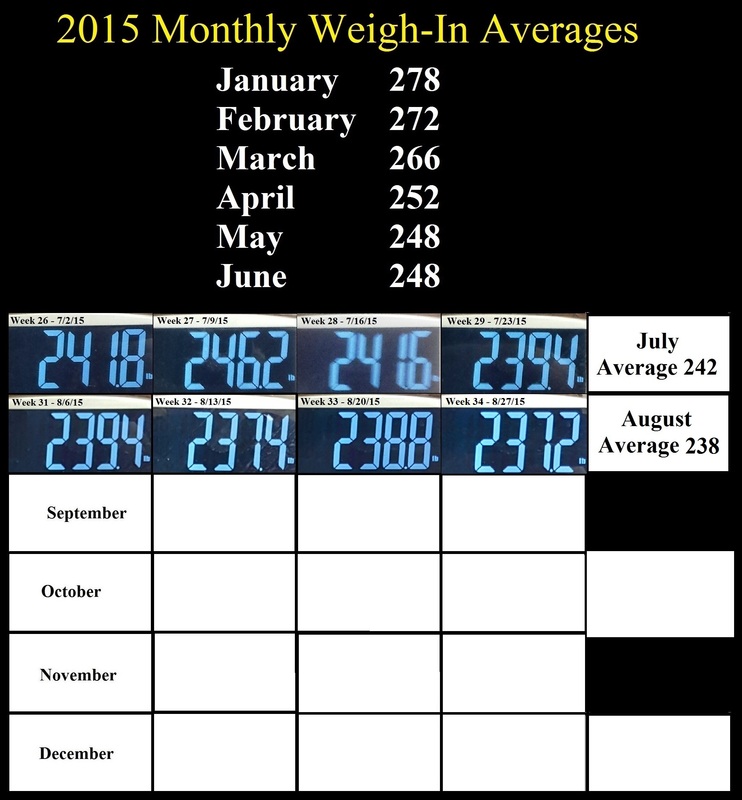 The lowest documented weight I’m aware of is being 222 lbs back around 2001 when I was in some bench press contest. If I finish out August with an average weight in the 230’s that will be my lowest average weight in nearly 15 years so, that’s very positive in terms of health and overall condition. 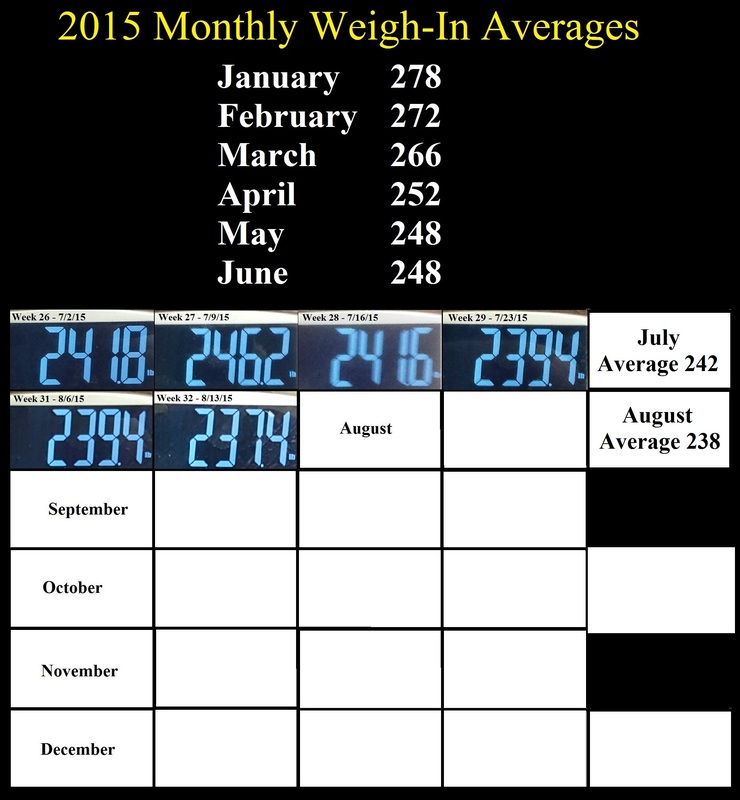 My initial goal at the beginning of this year was to weigh in the low 240’s. I wanted that goal because I don’t look like I’m 9 months pregnant at that weight and I have a lot more clothes to choose from. Having achieved that objective and dipping down into the 230’s I can notice more of a visual change in my appearance. For me, it seems like the scale can move much more rapidly than the tape measure around my waist. I once read that you have to lose about 5 lbs for every inch reduction in the waistline. I don’t really know about the accuracy of that assertion but the overall concept is sound. For now, there are three running goals in my head which should help keep my weight in check and perhaps continue to reduce my weight. For one thing, I would like to keep my running streak going. If I did the math correctly, 1% of a day, in terms of time comes out to 14 minutes and 24 seconds and that’s enough time for me to run a single mile and keep my streak in tact. On July 1st, when I started the streak I was thinking I could give myself a nice birthday present next July 7th by having a full 365 day/ 1 year running streak under my belt. This would also qualify me as a neophyte and get me listed as an active streaker with the United States Run Streak Association (USRSA). The third goal is a bit more ambitious. I use SmashRun.com to track my runs and provide me with valuable statistical data about my runs. They have a badge which can only be earned by running 10 miles per month more than the month before for 6 months in a row. That means I have to hit 117 miles for this month, 127 in Sept and 137, 147, 157 miles for Oct, Nov & Dec. That’s a lot of miles and my brain isn’t quite sure what to make of it all but I think it’s a worthy goal and perhaps one I should not shy away from. I am thrilled & tickled to death over this morning’s weigh in. I didn’t even realize Thursday was upon us so this weigh-in is very candid – and yes, I did skip my week 30 weigh in. Well folks. I’ve recently “upgraded” to Windows 10 and once all the bugs are figured out it will probably be a pretty good operating system. I spent about 2 hours last night after the Win10 upgrade upgradeing the upgrade with drivers just so this great new operating system would recognize the fact that I have a 2nd monitor plugged into my laptop. For whatever reason, there are still gliches with pictures and the pics I would normally post with my weigh-ins are all showing up as broken links. Essentially – I weighed 239.4 today which is the exact same weigh in I had 2 weeks ago but I am extremely happy about it. You have to understand that dropping weight is NOT a linear process and that’s part of the reason I predominately concern myself with my monthly average and never get too worked up over any single weigh-in. What’s most important is the overall direction in which you are heading not what any snapshot static weight says on any particular day. During this process, we may see glimpses of what lies ahead. Two weeks ago I saw a glimpse of the direction I was heading but today we may start to take this new low weight as a part of reality. It’s real. This also gives me a pretty firm foundation for a belief that I could actually have an average weight this August in the 230s which in itself is pretty remarkable. That Loonies Midnight marathon I did a couple weeks ago really threw me for a loop. 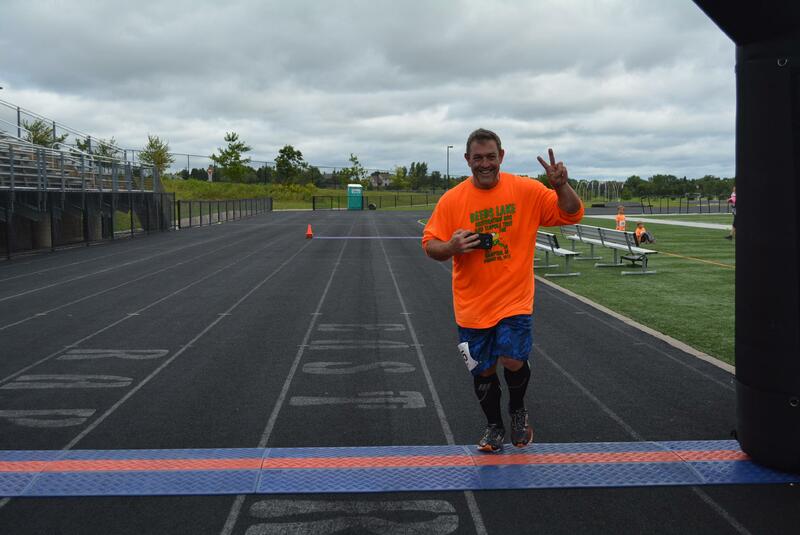 Running 26.2 miles during a time when you’re body is normally used to sleeping is a formidable challenge. I had a host of 1 mile runs leading up to that marathon and I’ve had mainly 1 mile runs since, with a few 5k distances thrown in. I’ll be getting some longer distance runs in this month and believe over the next couple weeks we can see even lower weigh-ins. oh & btw- the running goal for this month is 117 miles – also I’m on a running streak, 36 days straight now and I’m looking to make that streak 62 days on August 31st. and – I’ve taken on a VLOGGING challenge – a VLOG is a video blog. I’m doing something called VEDA which stands for Vlog Every Day in August. I created a new channel on YouTube called … i can run a minute and have been vlogging and learning on that channel. i really do have to run but will probably try to embed some links or videos in upcoming blogs.